Focusing Proficiency Focusing is a skill that requires development over time, and acquires some of its shape and color according to the life and goals of the practitioner. Below is a general description of Focusing stages of proficiency. Focusing, by Eugene Gendlin Focusing, the technique described in the pages of this book, is uniquely suited to our turbulent times when so many old forms are crumbling and old roles are vanishing. Most of us are having to invent, discover and create the next steps of our lives without a light, a map, or a relevant tradition. We are trying to keep apace of rapidly changing technology, trying to understand ourselves and our relationships, seeking new ways to be well, looking for meaning in our work and a new center of gravity within ourselves. ... Focusing is a key to personal momentum and unfolding, a dynamic process that can guide us through the tricky mazeways of a new world. 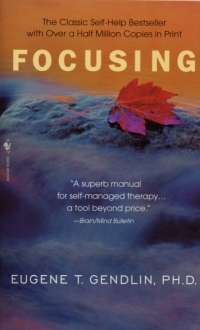 Introduction to UK edition of Focusing Twenty-five years ago when focusing was new, I shocked a colleague at the University by saying "The unconscious is the body." By now an emphasis on the body as a source of information and innovation is not new. But exactly how one can tap into this source is not yet widely known. Only from the Focusing Community can one get well-developed and tested instructions for direct access to embodied knowledge and the new steps that come from it. Three Key Aspects of Focusing by Ann Weiser Cornell. There are three key qualities or aspects which set Focusing apart from any other method of inner awareness and personal growth. The first is something called the "felt sense." The second is a special quality of engaged accepting inner attention. And the third is a radical philosophy of what facilitates change. Let's take these one by one. Six Steps These Six Steps are also available in Nederlands, Deutsch, Español, Dansk, Hebrew (PDF), Italiano, Portugues, Suomi and Japanese. Most people find it easier to learn focusing through individual instruction than through simply reading about it. The actual process of focusing, experienced from the inside, is fluid and open, allowing great room for individual differences and ways of working. Yet to introduce the concepts and flavor of the technique, some structure can be useful. We offer one approach here: six steps. Although these steps may provide a window into focusing, it is important to remember that they are not THE six steps. Focusing has no rigid, fixed agenda for the inner world; many focusing sessions bear little resemblance to the mechanical process that we define here. Still, every Focusing Trainer is deeply familiar with these six steps, and uses them as needed throughout a focusing session. And many people have had success getting in touch with the heart of the process just by following these simple instructions. Phone Sessions If you are interested in learning Focusing from a Certified Focusing Professional, we offer phone training sessions. These sessions are customized to help each person individually. One or several phone sessions will give you a beginning taste for Focusing. Proficiency as Focusing Partner The “Proficiency as Focusing Partner” (PFP) recognition is a first goal for people who experience Focusing as something they would like to learn more about, to continue/be involved with, and who want to have a solid experience of partnership exchange and personal Focusing process. With the skills developed in this training you will gain confidence, experience and knowledge about safe, supportive and competent Focusing Partnership. Workshops Workshops listed on this page are offered by The International Focusing Institute. For other workshops led by Focusing Institute-certified trainers, and for Changes groups, see the Bulletin Board Page. The International Focusing Institute workshops are usually taught in or near the New York City area. Most workshops are limited to twelve participants and all are experiential. We can help with accommodation and transportation arrangements. CEC credits are available. After you have taken a Level I Focusing Workshop, you can have a focusing partner. Books, Video, and Audio We offer a variety of books, audio tapes, and videos on Focusing and The Philosophy of the Implicit. These materials convey an accumulated body of wisdom about Focusing and teaching Focusing that has been developed over 30 years. Recommended books We recommend the following books which discuss, develop, cite or have integrated FOCUSING in some way. Most of them are available through Amazon Bookstore. Find a Certified Focusing Professional All of the focusing teachers in our database are certified by The Focusing Institute. All focusing teachers are encouraged to develop their own style of teaching and we hope you will eventually learn from more than one teacher. If you have trouble finding a teacher, please call or email The International Focusing Institute and we will try to help you. Not all of our teachers are on this listing. Also, if you can organize eight or ten people for a weekend workshop, we may be able to send a teacher to your location. How to Become a Trainer Becoming a trainer is a possibility for someone from any walk of life. You do not need to be a therapist or have other formal credentials. This is a human process open to any person. Focusing joins naturally with any kind of work in which you are attending to an ongoing process. For example, it can fit seamlessly into your work if you help others move forward or find more ease, or your work is about finding the right expression for something. You might be a nurse, a doctor, a massage therapist, a child care worker, a teacher, a home schooling parent, a secretary, a manager, a pastor or spiritual director, a hospice worker, a designer, a housewife, a retired person... Even if you start out learning Focusing so that you can use it in your own work life, you may find as you begin to apply it that you have a growing desire to teach it to others. For instance, a therapist may originally learn Focusing to use with their own clients, and later begin to see that they could train other therapists in their agency to use Focusing in their work, as well. Carrying Forward Many of us want to share focusing with others… but we can at times experience some difficulty translating our enthusiasm into effective communication. It's especially difficult when we want to communicate with people who, at first, have no special interest in focusing per se.